A MORE useful vice president, faster delivery of justice and more local decision-making are among the good things that charter change will bring, according to the proposal that the consultative committee tasked to study the proposals to amend the 1987 Constitution will submit to President Duterte this month. During a federalism forum last June 22, Vicente Homer Revil, consultant of the Department of the Interior and Local Government’s Center for Federalism and Constitutional Reform, also assured participants from the private sector that despite giving more power to states, federalism would not encourage the country’s breakup. If the Philippines shifted from the unitary presidential system to a federal setup, the federal (national) government would retain exclusive powers over “national defense and security; foreign affairs; citizenship, immigration and naturalization; monetary policy and banking; international trade and others,” Revil said. Federated regions (states), on the other hand, would have exclusive powers over “intra-regional infrastructure, public utilities and public works; regional economic development planning; regional parks and recreation; regional laws and programs; regional budget, local government and finance,” he said during the forum held in the Eduardo Aboitiz Development Studies Center. Power would be shared on items not under the exclusive realm of either the national federal government or the federal regional government, according to the proposal. A Federal Inter-Governmental Commission would have the power to review policies to empower federated regions, ensure their fiscal viability and resolve disputes between federal and federated regional governments. Business groups have expressed concern that by adding a new layer of bureaucracy, federalism would negatively affect the ease and cost of doing business. For one, businessmen are concerned about taxation under federalism, said Glenn Anthony Soco, immediate past president of the Mandaue Chamber of Commerce and Industry. “Would the taxes in Region 7 (Central Visayas), for example, be the same as those in Region 8 (Eastern Visayas)?” he asked during the forum. While regional governments would have more autonomy under federalism, this also raises the specter of regional governments imposing new and differing rules and taxes. “In the infrastructure development committee, we endorse so many projects. But we have to rely on the national government (for the budgets),” he said. But it did not specify whether this would include the budget to fund the implementation of big-ticket projects. Revil said the group is proposing the adoption of a “federal-presidential” model where the president and vice president would be elected in tandem for a four-year term with one reelection, with the vice president to be given a Cabinet position, so that he would no longer be considered just a spare tire. Under the proposal, the bicameral legislature would be retained. But in addition to that, there would now be a regional governor to head each of the proposed 18 federated regions. This regional governor would be supported by an elected Regional Assembly. To ensure the qualification of leaders, a college degree or its equivalent would be required of those running for President, Vice President, the Federal Senate, House of Representatives, and the Federal Regional Assemblies. The three judicial bodies to be supreme in their own spheres would be the (1) Supreme Court, which would have jurisdiction over disputes between the national Federal Government and regional federal governments as well as disputes among federal regional governments; (2) Constitutional Court, to have jurisdiction over the constitutionality of laws, treaties and other international agreements; and (3) Highest Administrative Tribunal, to have jurisdiction over reviews on appeal of decisions of the Civil Service Commission, the Commission on Audit, the Ombudsman, the Commission on Human Rights and others. The secession of any group of people or region would be prohibited and treated as treason. Revil said the committee is also proposing Constitutional provisions that would obligate the state to guarantee the realization of environmental rights, such as the right to clean air and water, and the preservation of ecosystems; and socio-economic rights like health, education and decent housing. 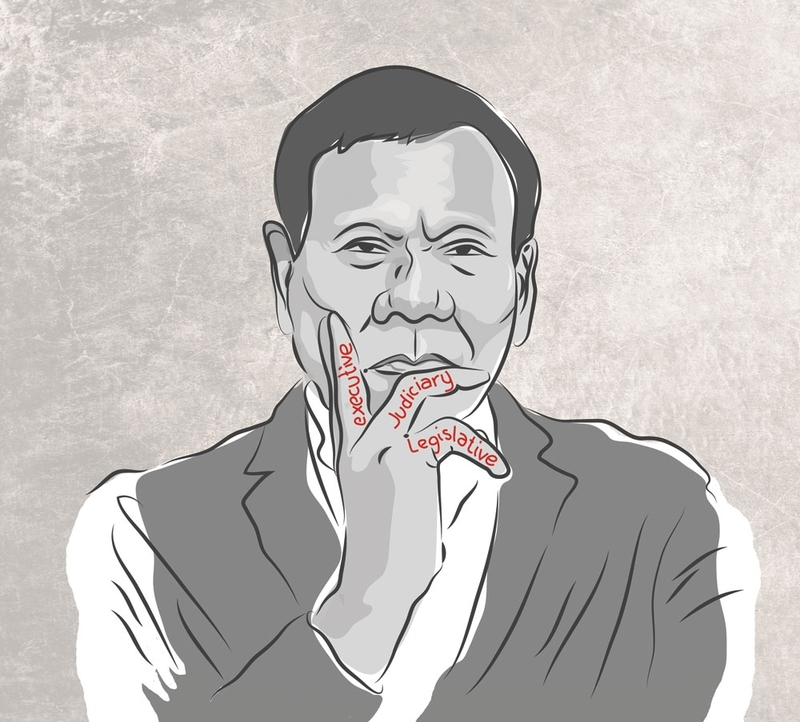 Despite claims by charter change proponents of the economic progress it would bring, the Caucus of Development NGO Networks (Code-NGO), the country’s largest coalition of social development civil society organizations, declared its opposition to moves of the Duterte administration to change the Constitution. Raising concerns about opening up the economy to foreign ownership, Code-NGO program advocacy officer Mariefe del Mundo said that more than the Constitution’s economic restrictions, foreign investors generally point to other factors like corruption and an unstable regulatory and policy environment, as well as peace and order problems, as the main investment disincentives. She added that while Code-NGO had advocated federalism since 2005 to decentralize governance and promote social justice, it was concerned about proposals filed by Congress to give the President not only oversight powers over all branches of government, but also “overwhelming appointive powers” without a clear check and balance mechanism. Revil admitted that the consultative committee led by former chief justice Reynato Puno could only submit its proposal to Duterte, but that it could not prevent Duterte or Congress from changing its provisions.